Thanks to movies like "The Karate Kid" and champions such as Chuck Norris, the art of karate is almost synonymous with martial arts. In reality, karate is only a small part of the martial arts, and represents only one aspect of the Japanese arts. Other popular Japanese arts include judo, ju jitsu and aikido. Asia is home to many different martial arts, including the many kung fu styles of China, but the martial arts of Korea are probably the most similar to their Japanese counterparts. Japanese and Korean martial arts have many similarities. Given the Japanese occupation of Korea and the resulting cultural exchange in the early part of the 20th century, this is hardly surprising. The traditional martial arts of both countries emphasise strong stances and powerful movements. Both Japanese karate and Korean taekwondo emphasise punching and kicking, with set patterns and breaking wooden boards a common display of prowess. Likewise, the Korean joint locking style of hapkido resembles Japanese aikido and ju jitsu. As Bruce Lee said, so long as people have two arms and two legs, there are only so many ways you can fight. Japanese martial arts are typically either descended from ancient battlefield arts, or from Chinese kung fu styles. Examples of the former include ju jitsu and the various Japanese weapon arts such as kendo or iaido, swordfighting arts that use bamboo and real swords respectively. 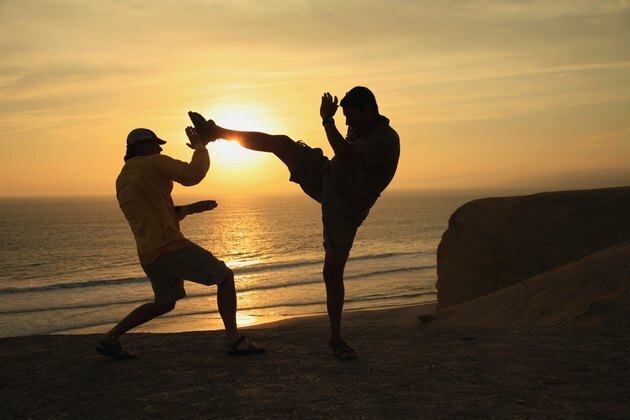 The many different styles of karate are descended from the island of Okinawa, where Chinese monks taught local farmers to defend themselves from Japanese occupiers. These forms became the various styles of karate. One popular style, kempo, translates loosely as "Chinese martial art." Korean martial arts also come from two sources. There are a number of ancient Korean arts, such as the striking art taekkyeon, the hybrid art hwarangdo or the wrestling art ssireum. These have been revived and reinvented by Korean martial arts enthusiasts. Other arts, such as Korea's most famous art, taekwondo, are based on the Japanese martial arts. Taekwondo was a synthesis of karate and Korean martial arts. The art was created by General Choi Hong Hi at the orders of the South Korean president in the 1950s. Choi was also a student of karate. Today, Japanese martial arts have a strong focus on strength and discipline. Traditional styles are seen as being as beneficial to the mind and spirit as they are to your fighting ability. Karate, often used as a blanket term in America, is split into many different schools, or ryu. Among the most popular are Shotokan, which emphasizes powerful movements and set routines; Kyokushin, which favors full contact sparring, and Goju-ryu, which includes soft and hard techniques. All karate arts focus on striking, while joint locks and self defense techniques also appear. Judo is a competition sport, while ju jitsu and aikido styles tend to focus more on self defense. They are often taught to security personnel, and emphasize joint locks, throws and restraints. Korean martial arts are renowned for their spectacular high kicks. This is most obvious in taekwondo, which features flamboyant jumping spinning kicks that are often seen in popular action movies. Taekwondo is divided into two main branches. World Taekwondo Federation taekwondo is an Olympic sport, known for it's emphasis on rapid kicking. International Taekwondo Federation taekwondo is more similar in style to karate, with a greater emphasis on self defense applications. Other popular arts include Hapkido and Kuk Sool Won, which focus more on joint locks and restraints.